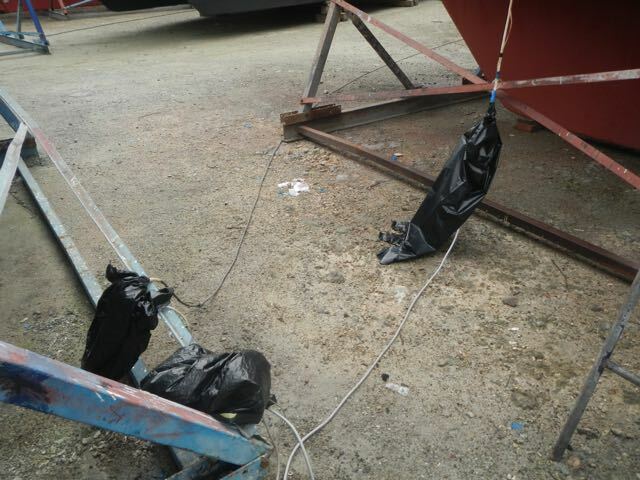 As you might know by now, the engine failure in Papeete required three weeks of work to repair. The failure was two-fold: both the injector pump and the lift pump failed. The injector pump delivers high pressure (up to 2000 psi) diesel fuel to the injectors, and the lift pump brings fuel from the tank to the secondary fuel filter and feeds the injector pump. It's extremely uncommon to have this double failure, but it happened to us. I was stumped and the Nanni Diesel mechanic whom we hired was also stumped. 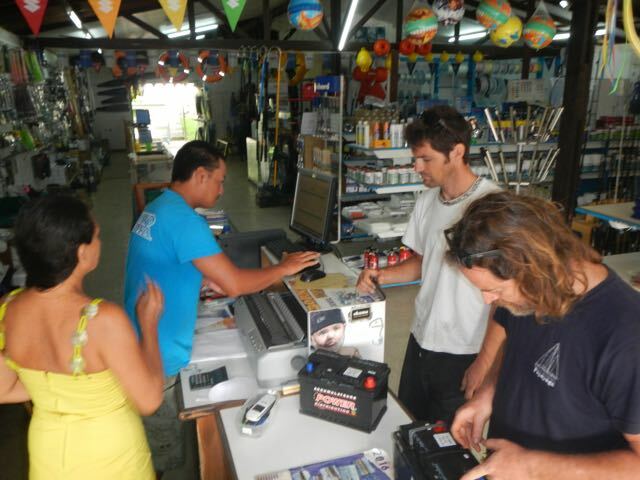 The time we spent sitting on our mechanic and waiting for parts meant that Conni's time was exhausted, so she flew from Papeete soon after bidding Bill a tearful goodbye as he departed Papeete and sailed Wings to Raiatea, a single-handed over-night sail. 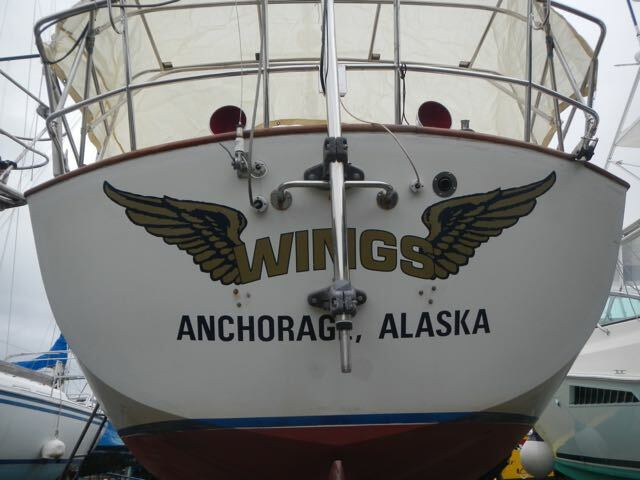 He decommissioned Wings by himself. 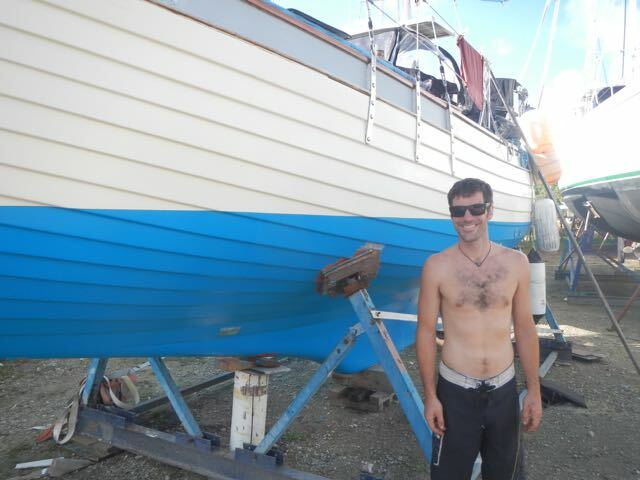 My friend Josh in front of his Nor'Sea 27 that he's sailed by himself from Alaska down to the South Pacific via Hawai'i. He says that he'll visit when he's next in AK. I hope so. This is a cover for our roller furl drum that I designed and had fabricated. After some good and careful measurements, a good drafting program on my computer, and some time, I delivered a working diagram to Madame Faux, the sail maker at Marina Apooiti who built it. It's a perfect fit! On a visit to Madame Faux's sail shop I saw these workers at midday sitting through the heat. 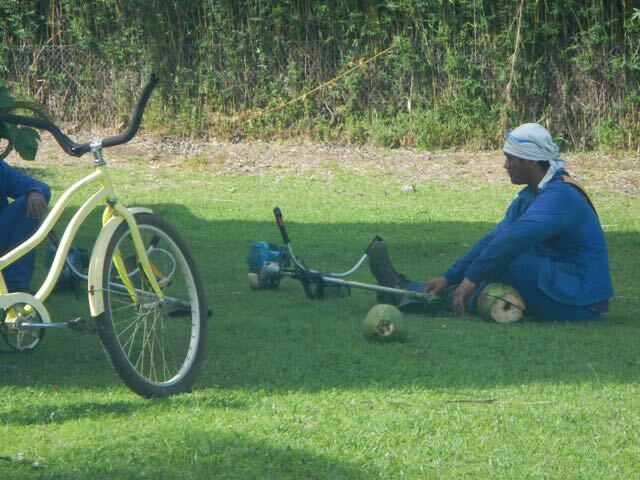 Shade, a few open green coconuts, and a gas-powered trimmer tell a tale. 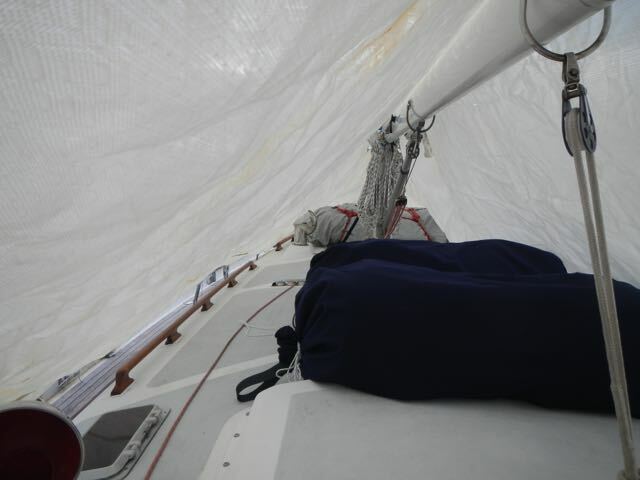 From under the shade cover supported by the boom sit our two new sail bags fabricated by Madame Faux. 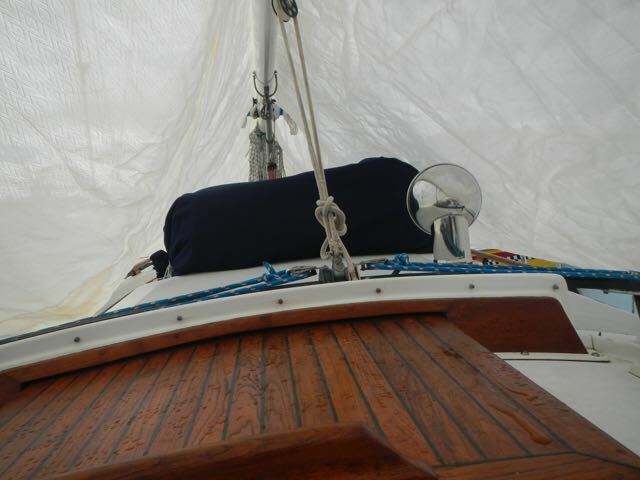 It's Sunbrella, waterproof and sun-resistent. 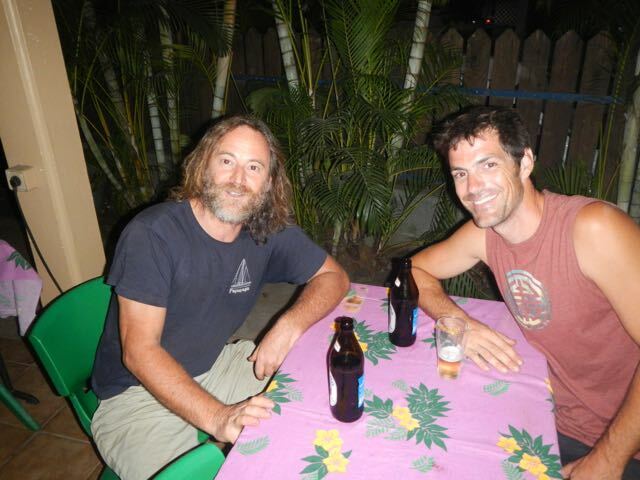 The three of us, Joe (Giovanni) from Italy, and Josh from Alaska, enjoyed dinner on my last night at the Snack Mimosa. 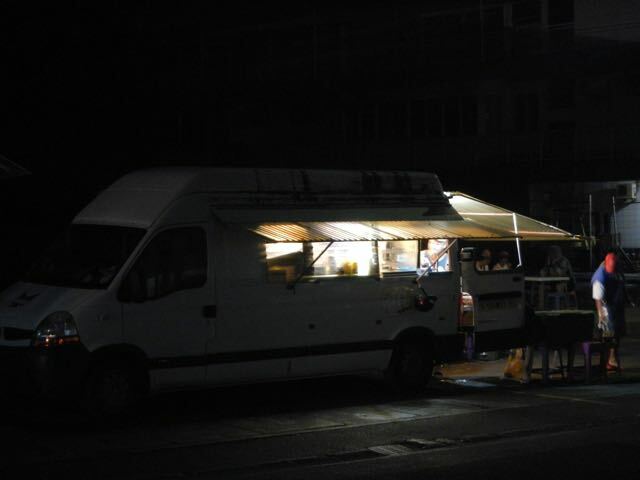 Across the street from Hotel Hinano sits this roulotte, or food wagon, serving huge meals of fish and meat plus fries at great prices. Locals crowd the open air dining room. 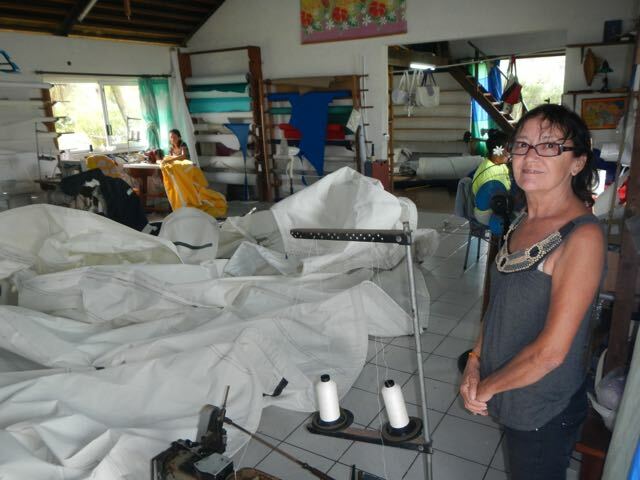 Madame Faux is the sail maker and owner of a sail shop located at Marina Apooiti, near our yard. Her daughter has returned from France and also work here, and a local woman complete the staff. Her English is good, her work is good, but it ain't cheap! 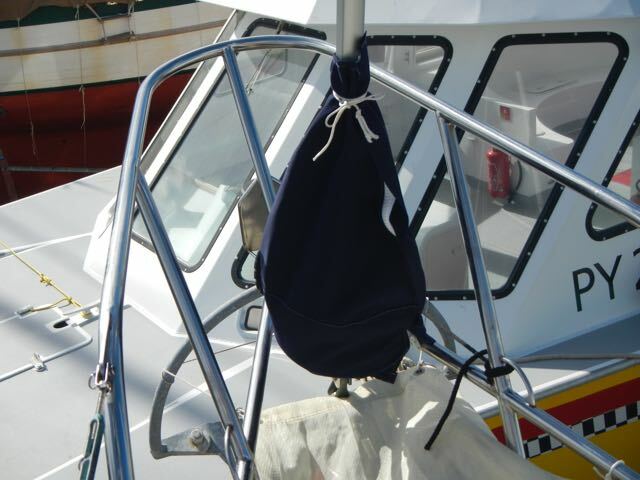 Our new sail bags and the rigging of our boom to remove our main sheet from the system so that I coud store it below. Nothing destroys line more quickly than a year's exposure to UV. Since I had the only vehicle, I chauffeured Joe and Josh around to buy different items here and there in Uturoa. Here we're clearing from a local chandlery. Power in the yard is primitive, to say the least, and there are few marine-grade plugs. Consequently, I had to build covers for all of the locations that the power cords joined. Will they survive until we return. Not a chance! My last view of Wings as I drove to the airport. 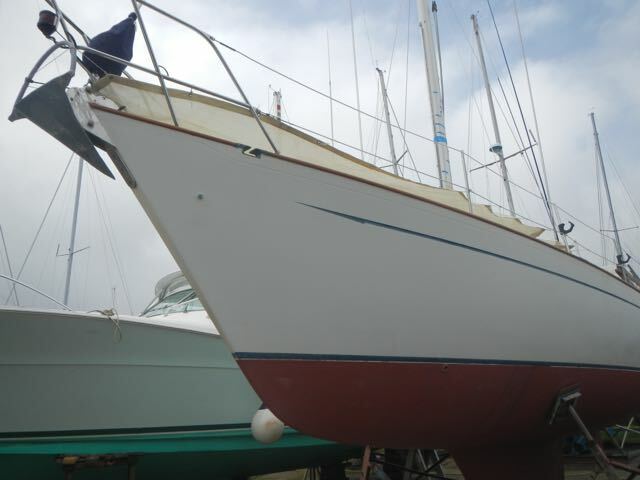 See you next year, my boat. She was as ready as I could make her. This photo is for me, mostly. It's instructive, though, since you can see the Hydrovane system, albeit without the rudder installed. Also visible are the gray power wire from the solar panels entering through a waterproof fitting at left near the cap rail, and the SSB antenna entering a similar fitting at right. The small antenna is the DSC antenna for the SSB.